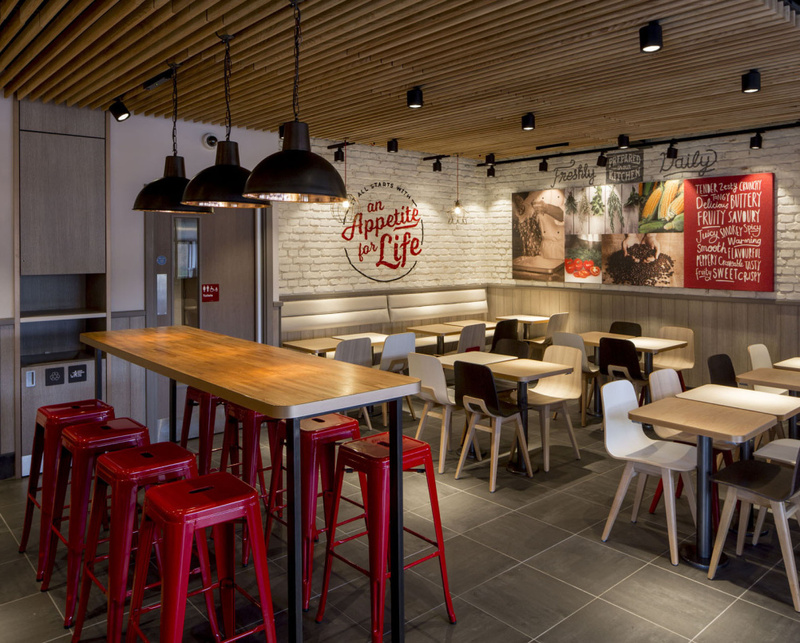 Fast-food restaurant chain KFC is launching a radical new design concept, which it says represents “the future of interior design for KFC”. 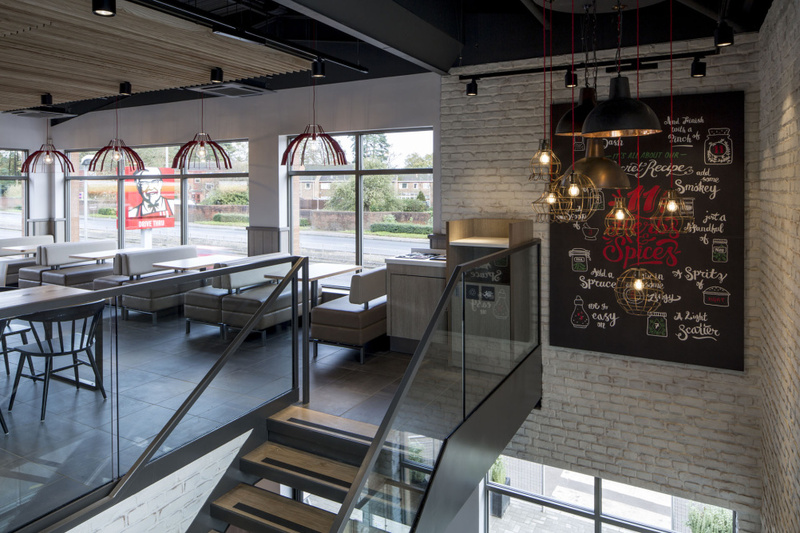 The “informal and stylish” new interiors are launching at KFC’s Bracknell branch, with the Exeter and Reading restaurants set to follow. KFC says it has plans to roll the design out nationwide – across its 870 branches – from March 2015. 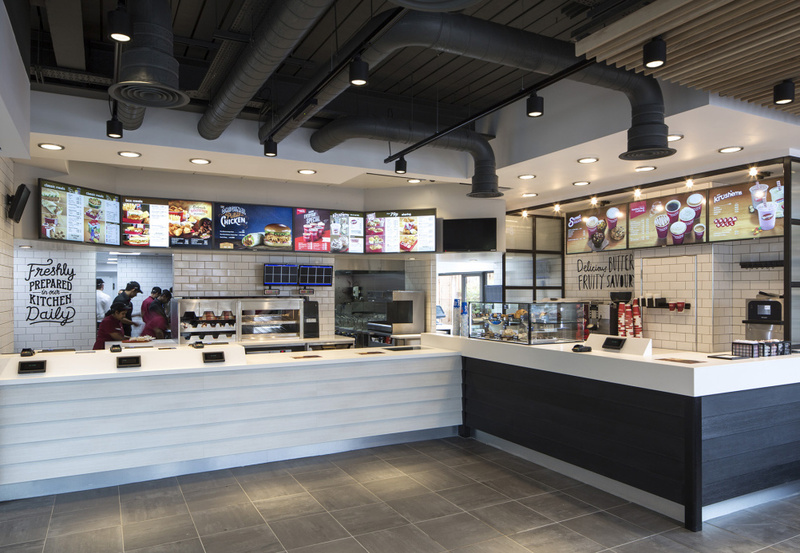 The new designs have been created by KFC’s in-house team, led by creative design manager Jade Swaby. The team worked with consultancy R&R on the project, while Finch Interiors also delivered elements of the design. 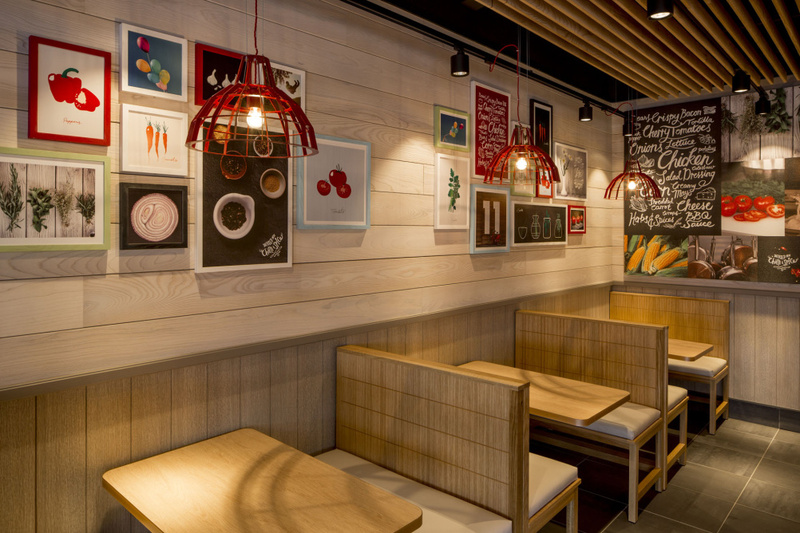 The new look features exposed ceilings and textured brick-effect walls as well as photographs and illustrations from commissioned artists that represent the ingredients in KFC’s food. Butchers block and timber plank kitchen tables are used, as well as loose furniture, while the space is lit by low-hanging copper lighting. Swaby says the design was inspired by “families and friends coming together around the kitchen table to share freshly made food” adding, “KFC was designed with sharing in mind”. The red colour of the KFC branding is used “sparingly” as an accent colour, appearing in features such as chair legs and graphics. The new design also boasts a “semi open-plan kitchen” which means that for the first time diners will be able to see their food being prepared. 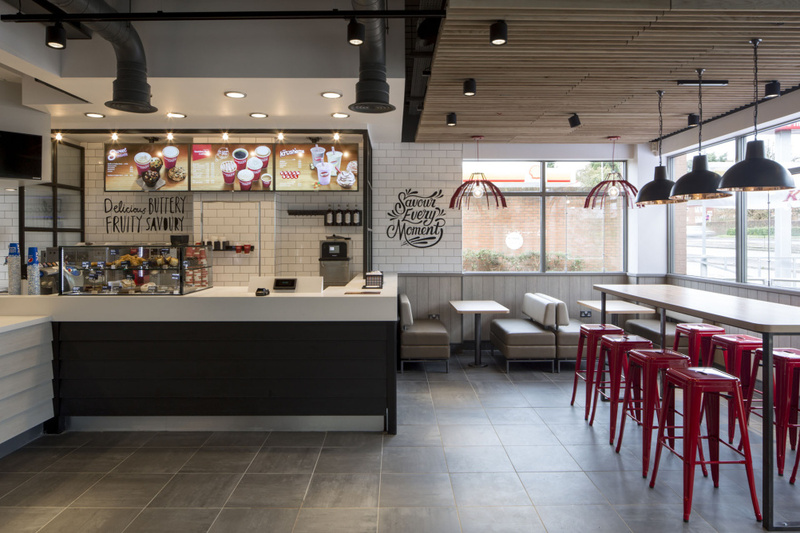 KFC says the redesign to the back-of-house areas also allows service to be much quicker. As much as I like this, there is something a bit unsettling and misleading about trying to mimic the independent-homely look for a behemoth fast-food chain. Lets hope this warm upgrade is reflected in a better and above-the-standards welfare for the chicken. 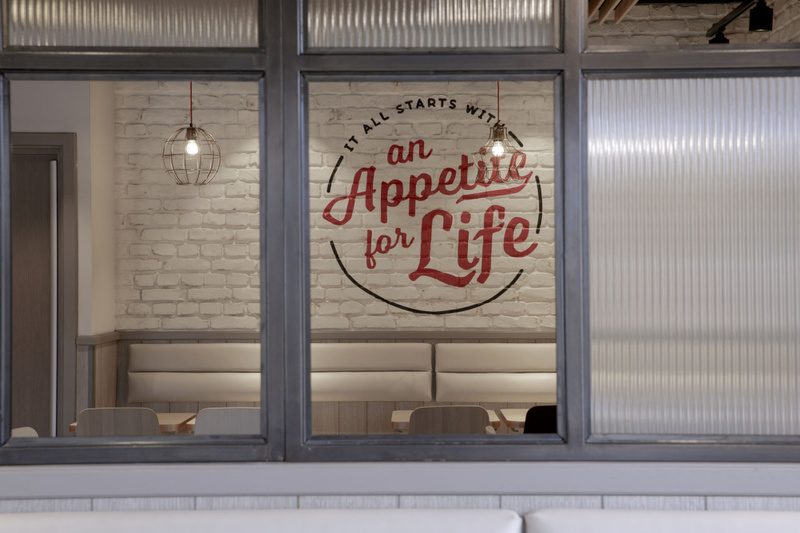 Interesting and positive move KFC – strategically sliding up market towards Nandos / Chooks territory. The work of KFC and Ms Swaby has surpassed the outdated stranglehold of previous KFC restaurants. I look forward to “savoring the moment” at my next KFC visit in the future. KFC has always been a cut above ‘similar’ restaurants because its chicken is actually fresh (albeit fried). 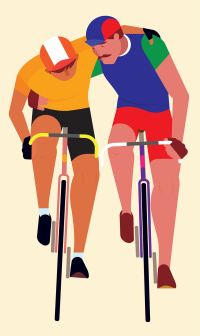 It’s good to see that reflected in a fresh design. If KFC’s chicken was served without a bucket-wielding colonol you’d think it was top-notch grub.. the same can’t be said for McPoison. work started by the KFC Design and Development team some 4 years ago. 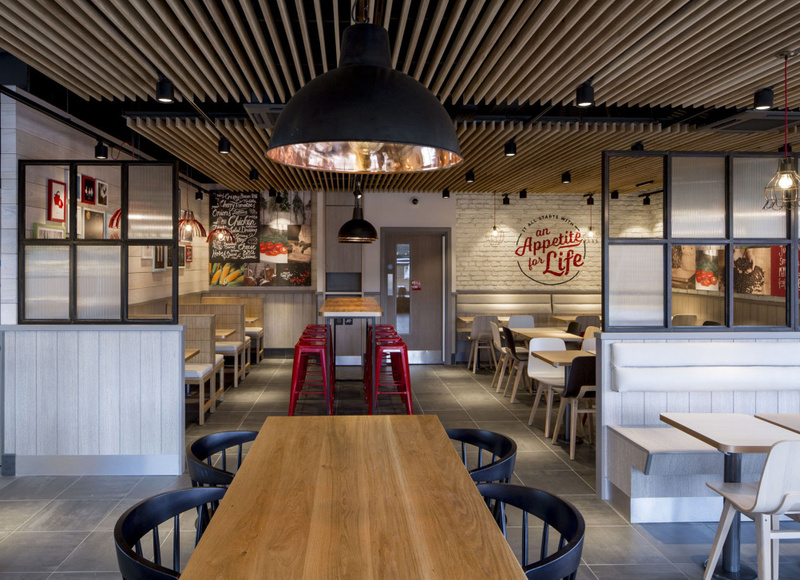 Finally KFC appear to understand design however this facelift isn’t creatively new its just long overdue! Like it, a very good move and massive brand change for a company that has struggled for so long with the past. Possibly good too that consumer retail brands have been moving into a more looser approach, making it a good time for KFC to shake off its historic ties. There are lots of contemporary hints in that design which shift the market position of KFC. I nice fit out job, it would have been nice to have credited the shopfitters too.